We all have that friend… Every other month they start a new diet. One month it is cutting out all sugar, the next is only eating vegetable products, the next is eating every two hours. No matter their current eating style, these gifts will be a great addition to their healthy menu planning and execution, while being encouraging of their current health goals. 1. Full Circle Water Bottle ($9.99) Perfect size to throw in a bag and stay hydrated all day. The glass bottle is earth-friendly and free of contaminants too! 2. Nut Butter ($15.99) Tastes so good they will forget it is healthy. 3. Scale ($34.99) Accurate measurements are key to tracking calories. Nothing is more accurate than a digital scale. 4. Spiral Cutter ($14.99) Cutting carbs? Zucchini and carrot noodles are an easy alternative. So your little sister just turned 21 and she is realllllly excited. Get her stocked up with cool gifts for Christmas beyond the basic bottle opener and shot glass. She’ll love these! Mixology Dice ($24.99) will inspire her to try new drinks while taking her cocktail making game to the next level. Moscow Mule Mugs ($19.59) So she can make her favorite drink at home. Bar Gems ($8.99) A decorative way to add a little glam to any drink. Mitten Flask ($19.99) Keeps her warm on the outside and the inside! These are things the bride needs for the big day, but when it comes to buying a wedding or shower gift, what do you get her? Many customers come into the store looking for shower gifts for a bride to be. This blog will give you a few ideas of the neat gifts you can purchase at The Carrot Seed. Also remember to tell the bride she can register at The Carrot Seed, which would make it even easier for you to know what to get her. 1. Here are three great wedding/shower gift ideas.The first gift idea is a tin of wooden spoons. If you are an artsy person and love Pinterest this is the option for you! Gather up a group of friends, (or just you can get creative too) and come up with some marriage advice. Then, write the marriage tips or quotes on wooden spoons that you purchased at The Carrot Seed and put them in a tin. Pictured below is what is this looks like. This was a shower gift for one of my friends and she displays it decoration in her kitchen. Each person that attended that particular bridal shower wrote a little something on a wooden spoon. I read some of them and they vary from practical to silly advice! 2. The second gift idea is a recipe keeper. What makes the recipe keeper so unique? The bride will be able to store and organize recipes from the Internet or clipped from her favorite magazine. Best of all, the recipe keeper can stand in upright position, making it easy user friendly and less prone to get spilled on. (I know what you are thinking. You want to get one too. Great idea! Then, you can tell the bride how much you love it.) The Carrot Seed also has recipe cards and boxes in all sorts of different colors, shapes and sizes. 3. The third gift idea is a wine box. I think the benefits of this gift are pretty self-explanatory. I mean, what bride wouldn’t want wine for a gift? The Carrot Seed sells a few different wine box options. The first is a single wine box that says, “Best Day Ever,” on it. The second is a black single wine box where you can write your own personal message in chalk. 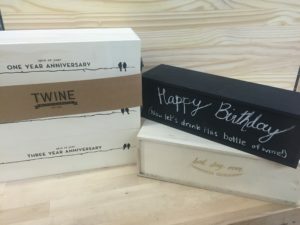 The third box option is a wine box that holds three wine bottles, a bottle to open up on their first, second, and third anniversaries. Although we don’t sell wine at The Carrot Seed, the Pheasant Restaurtant & Lounge in Brookings or Schadé Vineyard & Winery in Volga are great places to purchase wine.